Have a paper due next class, but don't have a printer? No time to stop by a computer lab or library to print? 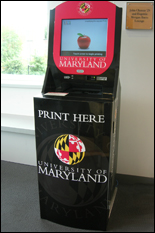 The Clark School has two WEPA kiosks available that print documents from a USB drive, your computer, or the web. The kiosks are conveniently located near the main entrance on the first floor of Glenn L. Martin Hall, and in the east wing student lounge on the second floor of the Jeong H. Kim Engineering Building. To pay for WEPA printouts, you can now swipe your UM ID in order to use funds from your Terrapin Express account (printing costs are $0.10 per black and white page, and $0.50 for color). To add money to your Terrapin Express account, either pay online, at the Terrapin Express Office in 1109 South Campus Dining Hall, at a Copy Center ATM located in McKeldin Library, or by mail or fax. Unless you are printing from a USB drive, you may need to create a WEPA account to sign into the kiosk, which will allow you to access your submitted print jobs. For more information about printing with WEPA, please visit our Printing at a WEPA Kiosk page.